With 12 synths and keyboards included, plus Spark 2, you'd be hard pressed to find a more powerful or better-value instrument collection. Great value. Good mix of synths and classic 'boards. Excellent bonus software features. Useful upgrade to Spark 2. Slick new authorisation system. Massive library of presets. Some interfaces are better than others. Arturia's V Collection plugins suite (VST/AU/ AAX/standalone) combines all the company's software instruments in one massively discounted bundle. Version 4 takes the total instrument count to 13, with newcomers Matrix-12 V, Solina V and Continental V joining the existing lineup. Other important changes include the introduction of ASC (Arturia Software Centre) - a new dongle-free installation and authorisation system - and the upgrading of Spark Vintage Drum Machines to the full-spec Spark 2. Awarded four stars back in July 2014, this uses analogue synthesis, physical modelling and multisampling to deliver both drum kit and classic drum machine sounds, with integrated step sequencing, in-depth sound editing, modular core sound manipulation and SparkLE controller support. Oberheim's Matrix-12 is an 80s polysynth renowned for its exceptional fatness and powerful modulation matrix. With two oscillators (outputting saw, square and triangle waves), five LFOs per voice, a 15-mode filter and five ADSRs, it's still regarded as one of the greatest analogue synths ever made. "V Collection 4 represents excellent value and adds some welcome new sounds to the existing lineup"
Arturia's Matrix-12 V has all the features of the hardware, including both Single and Multi modes, and a collection of presets based on the original factory patch list. The interface employs a fresh design, however, spread across Main and Voices pages, and extras including two global effects slots and an additional 20 Mod Matrix slots. Like the Oberheim, there's per-voice Detune, Transpose, Pan, Level and key Zone assignment (for setting specified note ranges to play assigned voices), and the Zone mode can be set to step through the voices as you play, with each note triggering the next voice (complete with all its individual settings) in the list. This feature regularly crops up in the preset patches, providing textural interest in some cases and full-on arp style pitch and panning variations in others. On the subject of presets, Matrix-12 V comes with a sizeable categorised library, the vast majority of which comprises characterful (as opposed to generic) leads, pads and effects. There are also plenty of basses, but with a few exceptions these tend to fall into 'pad-like' territory. Understandably, the presets based on those of the original synth use none of the additional effects, and thus sound a bit dull by modern standards. Matrix-12 V is very good at generating rich, textured sounds but not quite so adept at more punchy, edgy stuff - much as you'd expect from an 80s analogue polysynth. Arturia's instrument range includes classic keyboards as well as synths, and two of the V4 newbies - Vox Continental V and Solina V - fall into that category. Vox Continental V (which we've previously awarded five stars) draws on the model 300 and includes two four-octave manuals and a one-octave bass pedal board. It's easy to program and captures the rawness of the original, but its many software extras - more stops (Pitch and Percussion), tweakable Vibrato and Tremolo effects, onboard reverb, Background Noise level, key contact unpredictability, speaker emulations (Leslie and Guitar Amp), effects pedals, and two slightly different overall 'flavours' (Jennings and Vox) - take it to another level. We love it every bit as much now as we did six months ago. 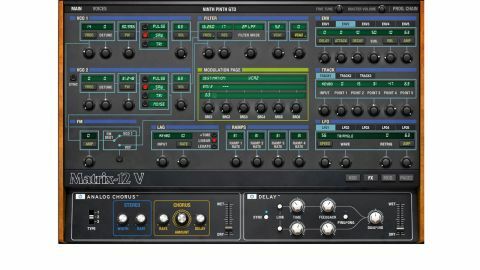 Solina V is based on Eminent's classic string machine, and the interface includes the same basic control set as the original keyboard, with Bass (Cello and ContraBass) and Upper (Viola, Violin, Trumpet and Horn, plus a bonus in the shape of Humana) instruments occupying separate key ranges. "All three new additions are very good, going way beyond the venerable classics they emulate"
The Bass instrument is monophonic but two-voice when both sounds are selected together, while the Upper instrument is six-note polyphonic. The global envelope attack and Upper instrument release can be tailored using the Crescendo and Sustain Length controls respectively, and rounding things off in the main interface is an Ensemble effect. Clicking the Open button at the top of the GUI reveals a host of extra controls, including three auxiliary effects modules (delay, modulation and reverb), aftertouch and velocity mapping to global Level and Brightness, LFO-based Tremolo and Vibrato, and a Stereo/Mono Ensemble switch. Solina V's real advancement over the hardware comes from the Bass and Upper sound parameters. For the Bass, these include independent amplitude Sustain, filter Cutoff and Resonance, filter envelope (Attack and Release) and arpeggiator. The Upper Resonator controls consist of a three-band formant filter with global High-, Low- and Band-pass options, and band- specific Gain, Resonance and Cutoff. Compared to the many sample-based software string machines on the market, Solina V trades some sonic authenticity for enormous flexibility. This is made obvious by the preset library, which contains some excellent arps, basses, leads, pads and strings that take it way beyond the instrument that inspires it. V Collection 4 represents excellent value and adds some welcome new sounds to the existing lineup. Our favourite newcomer is the Continental V, but all three new additions are very good, going way beyond the venerable classics they emulate and maintaining the V Collection's status as far more than just a set of predictable retro emulations.